Burnt my Hawaiian pizza today! Should have put it on aloha setting! Why did the Jelly baby go to school? He wanted to be a smartie! My wife laughed when I told her I was going to make a car out of spaghetti. She soon stopped when I drove pasta! Bloke thought he'd try something new at the local curry house. He went for Pelican Madras. Quite tasty but the bill was enormous!! How does Bob Marley like his donuts? With Jamin! Why do the French like to eat snails? Because they don't like fast food! Why did the fisherman put peanut butter into the sea? To go with the jellyfish! What's white and fluffy and swings through the jungle a......meringue-utan! Waiter, this food tastes kind of funny? Then why aren't you laughing! 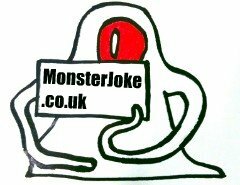 What did the baby corn say to it's mum? Where is pop corn? Why did the tomato turn red? It saw the salad dressing. Did you hear the joke about the peanut butter? I'm not telling you. You might spread it! Why is the beach never hungry, because of all the sandwiches.